mediaCue adds cue file support to Winamp 3. Cue files store information (Artist, Title, Time) describing smaller tracks within a large audio file. mediaCue allows you to easily manipulate these cue files; and more importantly, it presents you with a separate playlist composed from the cue information which you can use to easily navigate to any of the smaller tracks in the audio file, just like a normal playlist. You can also save this cue information within an ID3v2 tag (if the audio file is an mp3), eliminating the need for an external cue file. mediaCue also has an integrated mp3 splitter, capable of splitting both CBR and VBR mp3s. mediaCue is the logical successor to the popular Winamp 2 plugin, mp3cue by Jon Dee. I decided to rechristen my Winamp 3 plugin mediaCue in the light of WA 3 no longer being only an audio player; the actual plugin concept by itself is applicable to all types of media. In order for you to be able to identify and seek to any particular song within the mix, you would have to encode each song as a separate MP3 file. So what's the problem ? Well, if you are listening to the music using Winamp, you'd probably get a pause between the tracks, as Winamp switches between them. Playlist ordering can also be an issue, not to mention managing all those files. Alternatively, you can rip the entire CD as a single MP3; but then how do get to a particular track within the mix ? Not only would you have to remember the location of the track, but the slider is hardly precise enough for large files. Needless to say, you don't retain any information about the individual tracks, and you would probably have to manage this information outside Winamp. Let's talk about a video. Say you want to watch your favorite scene in the movie. So what ? ... You've gotta remember, "Ooh, Arnie says something real funny at 36 minutes and 23 seconds ..." ? And then what ? Seek to 36:23 with the position slider ? Neither is that going to be easy to remember (Arnie says funny stuff all the time in all his movies) nor is it going to be easy to seek accurately and fast using the slider. Load up the desired media file Winamp. Bring up the mediaCue window in the playlist sidecar. In the mediaCue playlist window, right click and choose Add Track. Type in the details. The time fields are programmed for minutes, seconds and frames respectively. (There are 75 frames per second). Continue adding songs until all the songs in the album are added (or you are fed up... whichever comes first). Then just double click the song in the mediaCue playlist to have Winamp seek to that position. hooray ! Now, you can export this playlist to a cue file. Simply right click and choose Export Cue Sheet. The file will be appropriately named and stored (see details section below) so that mediaCue will automatically find and load it up the next time. Import Cue Sheet allows you to specify an alternate cue file to load as the mediaCue playlist. Remove from MP3 removes only the ID3v2 frame saved in the MP3 by the above command. If you want to Remove or Edit a track, just right click the appropriate track and choose the appropriate option. You can extract a single track from the MP3 into a separate MP3. Right click the track and choose Extract Into MP3. You can also split the entire MP3 into its component tracks based on the cue sheet. Right click the mediaCue window and choose split. The current track playing is marked with a solid rectangle border. Show Frame Time - Choose between a min:sec display vs. a min:sec:frame display. Search for cue sheet first - If you start playing an mp3, don't check the ID3v2 tag for the cuesheet frame without first checking for an external cue sheet. Jump to First Track - When the media file starts playing, automatically jump to the first track specified in the cuesheet. Write ID3v2 - The newly created MP3s will have ID3v2. Force Xing header - Usually, only VBR MP3s possess a Xing header. You can however force even a CBR to be created with an accurate Xing header. 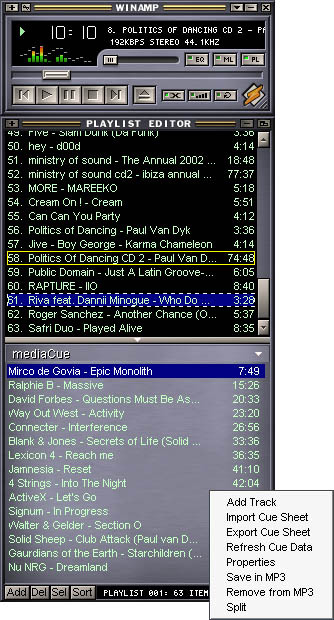 Cue sheets created by the Winamp 2 plugin can be read by mediaCue and vice versa. The same goes for MP3 support as well. Save to MP3 in mediaCue and the Winamp 2 plugin will pick it up ... and vice versa *sigh*. mediaCue can be used for all types of media files, as long as Winamp 3 is capable of seeking within them. hooray ! Press TAB to go to the next field in the dialog boxes. Both menus, the track menu and the mediaCue menu come up on right click ... you get the former if you right click on a song, and the latter if you right click elsewhere in the window ... sometimes you have to try several times before getting the right menu. Can you Suggest some alternate behavior ? General buffer checks have to be put in all over the place. Disable MP3 specific options in the menus when you aren't playing an MP3. The splitter currently simply stops if it encounters bad Synch within the MP3 - it will split upto the point with the bad Synch and no more. Make it more tolerant of this / make the behavior configurable. Give users the option of putting the mediaCue playlist in the poppler or in another window or integrate it into the normal playlist itself, if possible. Certain media files apparently have a "contents" section stored within them. If I get enough info on this, perhaps I can populate the cuesheet automatically, so that you don't have to add the tracks in yourself. Rewrite the documentation & this page as well. Include a text readme with the plugin instead of this html file. Here's the installer. mediaCue v0.95b An uninstaller and a readme page will be created in the Winamp 3 folder. Restart Winamp and the plugin window should show up in the playlist sidecar. Can't get any simpler than that now, can it ? mediaCue is quite useless without the poppler plugin becuase the sidecar has minimal functionality without this plugin - and mediaCue appears in the playlist sidecar. It will work, but you probably won't be too happy. Download Poppler Replacement 2 here It's a very minimal albeit useful plugin. (Thanks Plague). mediaCue is freeware.Give some money to your favorite charity and help your fellow man. And tell me about it. When exporting cue files from mediaCue, it will automatically supply an appropriate name. If you stick to the supplied name, mediaCue will find the cue sheet automatically when the file is next loaded. Alternatively, you can specify any file you want when importing a cue sheet for the current song, but then that would have to be done manually each time. As this is a BETA release I really would appreciate it if you guys could check everything out ... from cue sheet parsing to ID3v2 integration and MP3 splitting for all kinds of MP3s etc. Do look at the BETA ToDo section; I would really appreciate any suggestions and bug reports. If there is a problem with the plugin, include as much detail as you feel relavent. I would really really appreciate any suggestions or bug reports from you. A few words of appreciation would go a very long way too. If you want to volunteer to test out new versions of the plugin, drop me a line. The only reason why the release gets delayed is because I have to test the plugin myself ... and I usually keep putting it off for later. Believe me, testing the mp3 support is no frickin joke. First of all - Jon Dee, for writing the original plugin and taking the time to explain all the details of his plugin, ID3 tags and Trance in general. Nullsoft - For Winamp, Wasabi and their amazing free Installer - NSIS. The guys on the Winamp 3 Developer forum very helpful esp. WHEREamI, Tuatara, Russ and Plague - and you, my BETA testers as well :). Thanks.